If you’ve been on Twitter for a while, you’ve probably noticed people using hashtags—those funny # signs preceding a word or phrase. 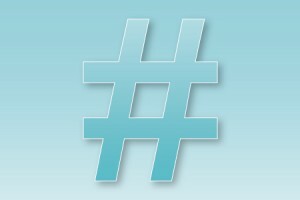 Hashtags are a way of labeling a certain tweet as belonging to a certain conversation. For example, a writer tweeting a question for a literary agent will use the hashtag #askagent. This way, anyone else searching for questions and answers with literary agents will be able to find it. Hashtags can also be used to track and participate in Twitter chats—ongoing or regularly scheduled conversations about a certain topic or theme. There are Twitter chats dedicated to just about every kind of writing, from screenwriting to romance to YA to journaling. Participating in writer chats is a great way to network with other writers, ask questions, and find interesting people to follow. A “slow” chat on Twitter is an ongoing conversation that anyone can post to at any time. For example, writers posting to the #writegoal hashtag tweet about their current writing goals whenever they feel like it. For a great list of slow chats for writers, look here. A regular chat occurs at a specified time each week. Regular chats are usually between one and two hours long, are often moderated, and sometimes feature a special guest. Regular chats are a great opportunity to network with other writers and establish your presence on Twitter. For a schedule of writer chats organized by day, see this excellent resource. The easiest way to follow a Twitter chat is to use one of the many websites specially designed for this purpose. The best one I’ve found so far is TweetChat. Simply log into TweetChat and type in the name of the hashtag you wish to follow. TweetChat will display the chat in real-time, updating as new tweets are added, and filtering out any tweets that do not contain the hashtag. It’s OK to be a lurker. Before participating in a Twitter chat, it can be helpful to simply lurk for a while and take note of what other people are saying. What kinds of questions do they ask? Which questions have already been asked a hundred times? What type of comment is most likely to get retweeted/replied to? Lurking for a while can make it much easier to bring something useful to the conversation when you do participate—and reduce your odds of making an awkward faux pas. A chat can quickly dissolve into a cacophony of sub-conversations if participants don’t stay on topic. To make things flow more easily, spend a few minutes reading to catch up with the conversation before jumping in—then direct your tweets to the subject at hand instead of leaping in with an unrelated question or comment. Direct questions to the right person. In a crowded chat, it’s easy for questions and comments to get lost if it’s unclear to whom they’re directed. Let’s say you’re participating in #YALitChat, and the special guest tonight is @GuestAuthor. If you have a question, make sure you include @GuestAuthor at the start of your tweet so she knows the question is directed at her. Don’t worry if you can’t keep up. Depending how busy a certain chat is, the chat screen might update at a near-constant rate. It can be nearly impossible to read every single tweet that comes in. Don’t worry if you can’t keep up. You can always go back and read the entire transcript of the chat just by searching for the hashtag. Many regular Twitter chats have dedicated websites where transcripts are posted every week.